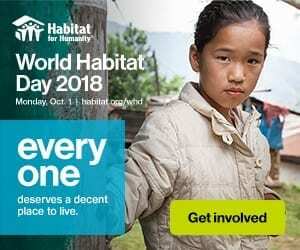 On World Habitat Day, Habitat for Humanity joins the United Nations and organisations around the world in raising awareness and in educating and mobilising individuals and communities to take action on the current global housing crisis. During World Habitat Day, Habitat draws attention to the important role decent housing plays ineliminating barriers to a better, healthier, more financially stable life. Seventy-five percent of people lack proper documentation for the land on which they live. Without land, there can be no housing, and housing is the key to stability and opportunity. For this reason, over 150 governments agreed to the New Urban Agenda as a global framework highlighting the need for urban policies to emphasize housing, focus on secure tenure and prioritize community-led development, and we must ensure governments are held accountable to their commitments.